These tumours tend to grow slowly and do not spread to other parts of the body. However, when they increase in size, there is a serious threat to the patient’s life. Modern surgical techniques allow complete removal of these tumours without serious side-effects in the majority of cases. What causes an acoustic neuroma (vestibular schwannoma) ? The cause of the growth of an acoustic neuroma is unknown. Further research into the molecular biology of why the nerve lining grows into a tumour, and into the effect of genetic change on tumour growths, is being carried out by members of the St Vincent’s Hospital department. The initial symptoms of small acoustic tumours are usually related to the ear and include one-sided hearing loss and ringing in the ear (tinnitus). The ability to hear speech is especially affected and the patient may complain specifically of inability to use the telephone in the affected ear. The facial nerve, despite being compressed and spread by the tumour, is rarely affected. Continuing growth of the acoustic neuroma causes numbness of the face, headache and worsening brain symptoms due to obstruction of the fluid pathways in the brain. 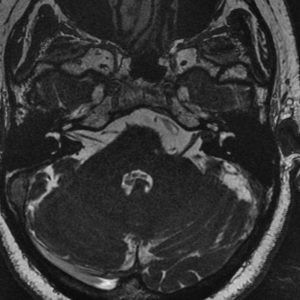 Acoustic neuromas are now typically diagnosed with the use of magnetic resonance imaging (MRI) scanning or CT scanning. The presence of a one-sided hearing loss following routine hearing testing usually leads to the suspicion of an acoustic neuroma. MRI is now the best test for diagnosing these tumours. The most proven and successful treatment for acoustic neuroma is microsurgical removal. This is the only form of treatment that achieves complete tumour removal. Microsurgical removal of an acoustic neuroma is undertaken by a neuro-otology team including two surgeons, anaesthetists, specialised nursing staff and rehabilitation physiotherapists. The use of modern surgical techniques and monitoring of surrounding nerves, especially the facial nerve, allows complete removal of the tumour without damage to these vital nerves. The St Vincent’s Hospital team has undertaken acoustic tumour surgery since 1964. The Unit has operated on the largest number of acoustic tumour cases in Australia and is recognised internationally as a Centre of Excellence. The Otology and Skull Base unit comprises of A/Prof Nigel Biggs, Dr Phillip Chang and Dr Sean Flanagan. The Unit has been conducting a prospective study investigating the optimal management for these tumours. This involves monitoring hearing, balance, facial nerve function as well as collecting data from quality of life questionnaires. Patients wishing to receive more information regarding this study can contact any of the members of the unit. The success in surgical tumour removal and facial nerve preservation is equal to or better than that of other specialist centres in the world. The results of surgery are published widely in international medical literature. There are however, a large proportion of acoustic neuromas (vestibular schwannomas) that are diagnosed at a small size, especially with the advent of MRI scanning. There is certainly a number of these tumours that are best managed by a careful program of surveillance. This is due to the natural history of many tumours where they do not grow in size. Certainly if progressive growth, or progression of symptoms is noted, reconsideration of interventional treatment is then made. There is a small subset of patients where early intervention for small tumours is considered with the goal for hearing preservation. Radiotherapy is also a viable option in the management of selected tumours. Modern techniques can now target the tumour itself, with minimisation of damage to the surrounding structures. The aim of treatment is to stop the growth of the tumour, and is best suited for growing small to medium sized tumours in older patients and in those patients who present a high anaesthetic risk. 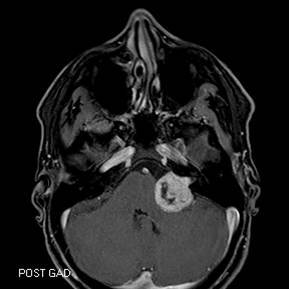 A left sided vestibular schwannoma (acoustic neuroma) which remains within the internal auditory canal. There is no contact with the brain and these tumours are often treated conservatively. This means a MRI scan is repeated at regular intervals to ensure that there is no growth. 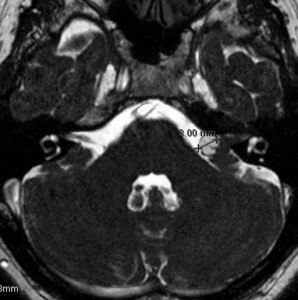 A left sided vestibular schwannoma (acoustic neuroma), with a small CPA (cerebellopontine angle) component. On this scan it is measured at 8mm. The tumour can be seen extending from the internal auditory canal, but is not is not in contact with the brainstem. The decision regarding treatment is dependent on a number of factors. In many cases tumours of this size remain stable and can be closely observed with regular MRI scans. If growth is documented, however, interventional treatment is then indicated. A moderate-large left sided vestibular schwannoma (acoustic neuroma). The imaging characteristics of this scan indicate that a large proportion of the tumour is fluid filled, or cystic. Cystic tumours usually have a faster growth rate. 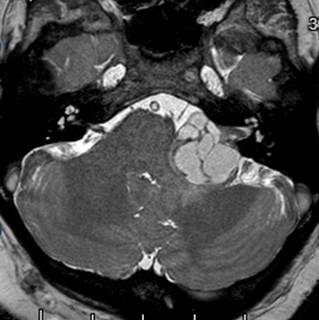 This tumour can be seen compressing the cerebellar peduncle with effacement of the 4th ventricle. There are three major approaches to acoustic tumours. The neuro-otological surgery team must have the skills to undertake any of these approaches. The tumour size, location and the level of hearing determine the type of approach. A large number of patients with acoustic neuroma have poor hearing at the time of diagnosis. The translabyrinthine approach involves removal of the entire ear bone and inner ear allowing minimal retraction of the bone and early identification and preservation of the vital facial nerve. Headaches are uncommon following this approach and most patients can be discharged from hospital around the 5th or 7th post-operative day. An increased number of patients are now being referred with small tumours and useful hearing levels. This early detection allows the surgeon to consider the middle fossa approach in which the brain above the ear is retracted to provide access to the tumour lying in the internal auditory canal. Drilling of bone above the internal auditory canal preserves the hearing structures and allows the surgeon to preserve the hearing nerve in some cases. This approach exposes the tumour from behind the ear bone and also provides the opportunity to preserve the inner ear structures and hearing. This approach is primarily used for tumours that do not extend very far into the internal auditory canal. The formulation of the ideal management plan is a complicated one and often requires an extended discussion with the surgeon, weighing up the tumour size, current symptoms and general health. There are also important considerations regarding rehabilitating hearing as well as balance function. Please contact any of the members of the department to arrange an appointment if you have any questions whatsoever. Fagan PA, (1993) “Acoustic tumour – A guide for GP’s” Mod Med Aust 38-46. Fagan PA, Krishnan S (1996) “Frank Ellis Memorial Oration: A Brief History of Tumour Surgery of the Cerebello-Pontine Angle”, Aust J Otolaryngol 2:4 417-428. Krishnan S, Fagan PA, Tonkin JP, Sheehy JP, (1996) “Results of Surgery of tumours to the Cerebello-Pontine Angle” Aust J Otolaryngol 2:4 429-436. Beaumont CI, Fagan PA: (1989) “Hearing Preservation in Cerebello-Pontine Angle Surgery: An ongoing Study.” Neurological Surgery of the Ear and Skull Base, Proceedings of Sixth International Symposium, Zurich. Ed. by Fisch U., Valvanis A., Yasargil MG, Kugler, Gherdini. Amsterdam. 217-226. Reid C, Fagan PA, Turner JJ (1991) “Cerebello-pontine Angle Lipomatous Hamartoma of Nerve: A Case Report”. Am J Otol. 12:5 374-377. Atlas MD, Harvey K, Fagan PA: (1992) Acoustic Neuroma: Hearing Preservation Surgery. A five year follow-up.” In: M Tos and J Thompson (eds) Acoustic Neuroma. Proceedings of the 1st International Conference on Acoustic Neuroma. Copenhagen, Denmark. August 25-29 1991. pp681-687. Amsterdam-New York. Kugler Publications. McEwan J, Fagan PA: (1993) “Facial Nerve Results in Cerebello-Pontine Angle Surgery” Aust J Otolaryng. 1:3 217-222. Sillars H, Fagan PA, Doust B, Turner J (1993) “Lipomatous Hamartoma of the Cerebello-Pontine Angle”, Aust J Otolaryng. 1:4 342-345. Reid C, Atlas M, Fagan PA: (1994) “The Value of the Facial Nerve Monitor in Cerebello-pontine Angle Surgery.” Aust J Otolaryng. 1:5 415-416. Talbot A, Tonkin JP, Fagan PA: (1994) “Vestibular Schwannoma in an Only Hearing Ear”. J Laryngol Otol. 108: 983-985. Talbot A, Fagan PA, Doust B: (1995) “Cystic Acoustic Neuromas.” Aust J Otolaryngo. 2: 53-57. Fenton JE, Fagan PA (1995) “Facial Nerve Outcome after Acoustic Tumour Surgery” Surg Neurol 44: 94-96. Fagan PA, Sheehy JP, Chang P, Doust BD, Coakley D, Atlas MD (1998) “The Cerebello-Pontine Angle: Does the Translabyrinthine Approach Give Adequate Access?” Laryngoscope 108: 679-682. Wijetungia L.H. Raj, Fagan PA, Sheehy JP, (1998) “Petrous Apex Meningiomas: An Alternative Surgical Approach” J Clin Neursc 5:3 310-317. Ajal M, Atlas MD, Fagan PA, (1998)”Giant “Medial” Acoustic Tumours – The Question of Hearing Preservation” Aust J Otlaryng 3: 136-138. Briggs RJS, Fagan PA Atlas MD, Kaye A, Sheehy J, Hollow R Shaw S, Clark GM, (2000) “Multichannel Auditory Brainstem Implantation: The Australian Experience” JLO 114: 46-49. Fenton JE, Chin RY, Fagan PA, Sterkers O, Sterkers JM (2002) “Predictive factors of long-term facial nerve function after vestibular schwannoma surgery” Otol Neurotol May 23:3 388-392. Panarese A, Turner J Fagan PA (2002) “Renal Carcinoma Metastasis: An unusual Cerebello-pontine angle tumour” Otolaryngol Head and Neck Surg, Sep 127(3): 245-7. Piccirillo, E. Wiet, M. Flanagan, S. Dispenza, F.Giannuzzi, A. Mancini, F. Sanna, M. Cystic Vestibular Schwannoma: Classification, Management, and Facial Nerve Outcome. Otology & Neurotology 2009; 30:826-834. Bacciu A, Falcioni M, Pasanisi E, Flanagan S. Intracranial facial nerve grafting after removal of vestibular schwannoma. Am J Otolaryngol 2009;30:83-8. Piccirillo E, Guida M, Flanagan S, Lauda L, Fois P, Sanna M. CNAP To Predict Functional Cochlear Nerve Preservation in NF-2: Cochlear Implant or Auditory Brainstem Implant. Skull Base 2008;18:281-7. Pogson J, Taylor R, Young A, McGarvie L, BE; Flanagan S, Halmagyi M, Welgampola M. Vertigo with Sudden Hearing Loss: Audio-Vestibular Characteristics. Submitted 2016. Sanna, M. Piazza, P. Shin, SH, Flanagan,S. Mancini, F. Microsurgery of Skull Base Paragangliomas. Book. Stuttgart. Thieme. June 2013. See also St Vincent's Ear, Acoustic Neuroma, and Skullbase Courses for clinicians.